A little beyond the southern extremities of our region can be found a landscape riddled with the remains of abbeys and monasteries. As one creeps ever northwards they thin out noticeably, and anything north of the Tyne is a very rare specimen indeed (we can thank the Scots and their periodic raids for that). The largest such establishment in Northumberland is thought to have been that on the south bank of the Wansbeck near Morpeth, and was called Newminster Abbey. This nigh-on forgotten religious house has now been almost completely wiped from the landscape, but it was quite a significant institution in its time. It was, in fact, one of the first daughter houses to be founded by the famous Fountains Abbey in Yorkshire – quite possibly the very first, some say. This all happened around 1137 when the Cistercians were invited north by local noble, Ranulph de Merlay, and his wife, Juliana. ‘Robert of Newminster’ from Fountains was appointed the new abbey’s first abbot, ruling the roost with considerable vigour from 1138 to 1159. A year after its founding the Scots came down and set the place abaze – and as part of the resultant peace treaty with the English pretty much everything north of the Tyne was ruled by the Scots during 1139-57. The monastery slowly recovered under Robert’s enthusiastic leadership, being properly rebuilt by 1180. Morpeth’s wealthy residents occasionally granted land and possessions to the young institution, and it came to exercise control over much of the land from the Wansbeck to the Scottish border. No one seems to know quite how extensive its influence was, but in time it spawned daughter monasteries of its own at Pipewell (Northamptonshire) and Roche and Sawley (both in Yorkshire). By the late thirteenth century, Newminster Abbey also had two hospitals dependent upon it, at Mitford and Allerburn. This all mattered little come the Dissolution, though, when it was officially sacked in Henry VIII’s first round of plundering in 1537. The Greys came into possession and thereafter began the systematic robbing of its masonry over successive generations. In turn, the Brandlings and then the Ords assumed ownership. Newminster Abbey was last used in 1937 for the 400th anniversary of its closure. Most of what remains today is hidden underground or under trees. However, a nice collection of photographs from the 1960s can be found here. 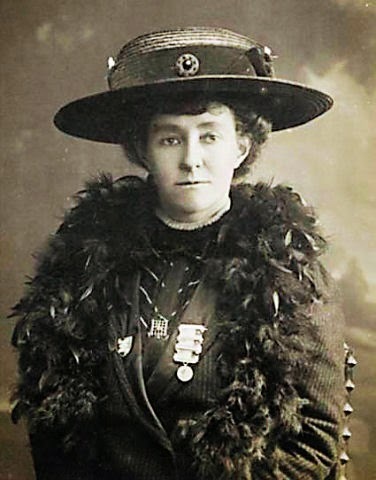 Emily Wilding Davison, the accidental martyr of the 1913 Epsom Derby, is arguably the most famous suffragette of them all. And as she is buried in Morpeth it is often assumed that she was a Northumbrian ‘made good’. The truth, though, is not quite as straightforward. So just what exactly were the woman’s North-East credentials? Firstly, she wasn’t born up here. She barely lived here, either. And we all know how and when she died. So how is it that she is interred in Northumberland’s county town and held so close to our North-Eastern hearts? Essentially, it’s down to her ancestry. On both her father’s and her mother’s side, Emily is rooted in England’s most northerly county. Her dad, Charles Davison, was 50 when baby Emily was born – a retired merchant who had been born in Alnwick with extensive connections in and around Morpeth. Emily’s mother, Margaret (nee Caisley), was Charles’ second wife and hailed from Longhirst, a little to the north-east of Morpeth – and was a good deal younger, too. Extended family of the couple was (and still is) scattered widely throughout the immediate area. However, shortly before Emily’s birth in 1872, the family had relocated to London – and she entered this world at Blackheath, in the south-east of the capital. After a childhood and youth spent at a considerable distance from her parents’ homeland, a promising education was cut short on her father’s death in 1893. With funds running short, her mother moved back to the North-East, settling in Longhorsley, to the north-west of Morpeth, and opened a shop. Though Emily never permanently lived in the village or the area thereafter, she would often visit her mother and relatives in the ensuing couple of decades. In 1906, Emily joined the Women’s Social & Political Union and became ever more involved and embroiled in the suffrage cause. Her repeated imprisonments and episodes of force-feeding often left her in a poor state of health. She would regularly retire to Longhorsley to recuperate … and to deliver the occasional provocative speech on the village green! Her horrific death at the feet of the King’s horse at Epsom in June 1913 immortalised her name and ensured her everlasting fame. She had left her mother’s home (until recently, the Post Office building in Longhorsley) a few short days before the tragic accident in order to make the trip south. After a funeral procession and memorial service fit for a heroine in London, her coffin was brought north by train, where she was laid to rest – in front of huge crowds – in her father’s family plot in the churchyard of St.Mary the Virgin, Morpeth. Mitford, the ancient parish to the west of Morpeth, contains within its church an item which claims to be the oldest surviving example of its kind in Britain. As you can see, it’s a church bell; and those who know about these things state that it is more than 850 years old. St.Mary Magdalene’s ringer is no longer in use, having been removed from the tower in 1862 – it still, however, hangs in the church, in a spot near the main entrance. Experts reckon that the curiously-shaped item was cast no later than 1150, which makes it an extraordinary survival – especially as the church itself was set ablaze on at least three occasions (once, in 1216, on the orders of King John, with many of the locals still inside). 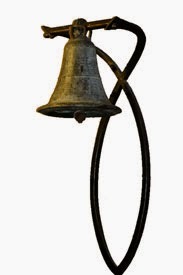 A quick search of the internet soon brings other candidates for the UK’s ‘oldest bell’ into view, many of them (like Mitford’s) amounting to unverifiable guesses. The only one which claims to be older is that at Hardham, Sussex, which may date to c.1100. In fact, there are no obvious examples worldwide that can claim a more distant origin … so Mitford may, in fact, possess the oldest church bell in the world! Margaret was the daughter of William Selby of Newcastle, who was a well-known money lender. She married Sir William Fenwick of nearby Wallington, and brought with her to the arrangement the estate of Meldon. This all happened a long time ago – in and around the late 17th century – and well before the construction of the current John Dobson-inspired effort known today as Meldon Park. Anyway, the only facts that seem to have trickled down to us from these distant days concern the infamy of Meg’s great meanness and avarice. Any income which came her way was greedily hoarded, being stashed away in any number of places across the parish. She was understandably disliked and therefore (of course) branded a witch; and when she and her husband passed into history, stories persisted of caches buried in almost every corner of the district. Such was her reputation, though, that the locals claimed that her spirit continued to guard over her riches after her demise, wandering from pillar to post, triggering tales of ghostly apparitions aplenty in its wake. Meg’s spirit would travel hither and thither by way of a subterraneous coach road, and she would often be seen on Meldon Bridge in the shape of a little dog – or, indeed, ‘in a thousand forms, lights and colours, flickering over the Wansbeck, or under a fine row of beeches by the river.’ She would sometimes present herself as a mysterious, beautiful woman; or sit in a stone coffin at the site of Newminster Abbey (water from this trough was used to treat warts and other ailments). Most famously, the ghost of Meg would sit guard over a well near Meldon Tower, where she was thought to have hidden a bull’s hide full of gold. She once enticed a local man to attempt its retrieval at the dead of night, but at the point of success he shouted in triumph, thus breaking the spell and causing the treasure to be dropped and lost forever. Understandably, any discovery of value in the neighbourhood has been attributed to the legend of Meg. Once, when the ceiling of Meldon schoolhouse gave way, a stash of gold coins issued forth from the attic, sending the pupils into a ‘rich scramble’ for their unexpected windfall. Every time a stash is thus revealed and put to some good, so the spirit of Meg rests ever more soundly. And, though Meldon Well still hides its bag of riches, the ghost of Margaret Selby has long since disappeared from the banks of the Wansbeck.